In a development that should surprise no one at this point, a massive snowstorm is predicted to arrive in the area on Sunday and hang around through Monday. I have nothing that I particularly need to do in the next few days, so I'm not overly concerned, but I do have some stuff planned for next weekend. Since today was cold, but sunny and dry, I figured it would be good to take advantage of the conditions while they lasted. 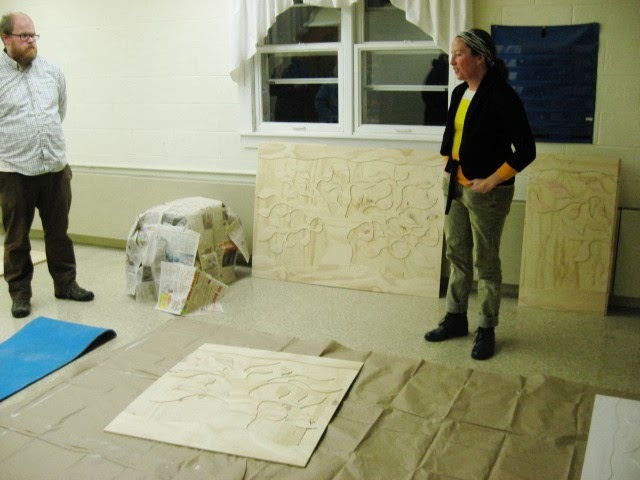 Next Sunday I am scheduled to have the first meeting of the latest round of woodcut classes in Belmar. Over the years I've developed a system of having much of the supplies in tote bags, and all those bags have been home with me the past weeks, since this winter is making it difficult to get around and I had a deadline to meet on my train postcard image. Still had some stuff in my Studio, such as the piece of birch I bought recently, and a crate full of heavier/bulkier items that will be necessary for class. I've seen a big enough snow storm literally shut down the town of Ocean Grove for a week. This one probably won't be that bad, but I figured since I had to get that stuff sometime this week, why not pick it up today? So in the afternoon I did that. On the way back I stopped in Belmar to check on a bunch of things. 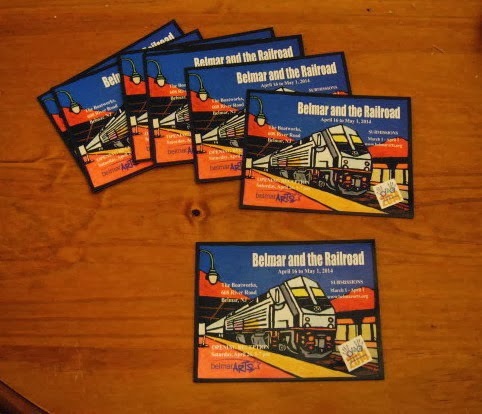 The Railroad show doesn't open until mid-April, but online submission start tomorrow, and there have been many e-mails flying around as we are trying to sort out the last minute details. I was part of that all week, and I believe all the questions are settled, but I thought it a good idea to verify that. And I had hoped that the postcards for the show had arrived and sure enough they had- above is short stack cards I took home. I had also wanted to check on the plan for continuing the fixing up of the Boatworks in preparation for next weekend's 10th Anniversary Juried Show reception. Even in a year without a hurricane, that building gets a lot of abuse, so we've been using the gap between shows for repairs and repainting. Also got an update on my class, currently at four paid students, and with a week to go more may be possible. Just about two weeks from today will be the first meeting of the latest edition of my Belmar woodcut class. I have three people already signed up (all new), expect at least two more (class veterans) and it's possible more may join before the first day on March 9th. Of course, if I have students, I have to make sure I have materials for them. I've built up a good supply of class tools, got plenty of paper, and I think I have enough ink to get started. Wood is trickier. I've been using quarter inch lauan since the early 90's for my own work, and so that's what I've been using for this workshop since I started it. However, lately the quality of such wood available at the big home chains has been lacking, so I wanted to see what other possibilities were out there. Over the weekend I stopped at a local lumber yard, the place where I believe Molly got the wood for the table project. I believe the wood for the tabletops was 3/4" maple plywood- very nice but very heavy and not cheap. The guy at the counter told me I should just head out to the back sheds and talk to the people there. Based on my description of the process, the guy suggested using something called MDO, or a medium density overlay panel. It's a piece of plywood with thin layers of medium density fiberboard, a composite material, bonded to both sides. I've never used the stuff, but it is popular with some relief printers. My friends at Drive By Press use it for a lot of their blocks, which get printed hundreds of times as they travel around the country. The girl who commissioned me to print blocks for her a few years ago had two of them on the two sides of a thick piece of MDF (just composite, no real wood core), and said she preferred it over real wood. The lumber guy generously gave me a three foot scrap piece to take home and test out. 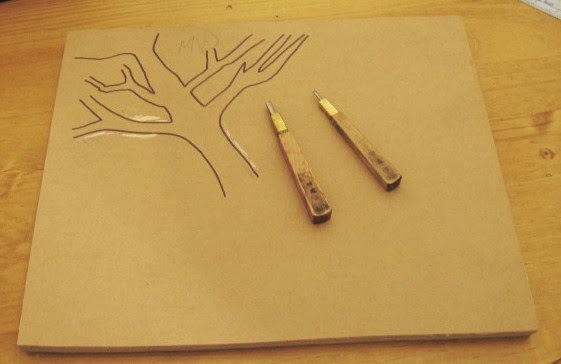 Later that afternoon I laid the board across my tailgate and drew that tree shape and tried cutting it with my gouges. It cut cleanly, but I'll want to test it with something more detailed, and then print it. Today I went out and got something more traditional. At my local big chain I got a piece of half inch birch plywood. Thicker and heavier than the 1/4" birch I have used, but nice and straight, looks well made, and it has two good sides, which cuts its effective cost in half. Stopped at the Studio briefly on my way home to cut a small section above off the MDO board so I could take it home to play around with. Left the 2'x4' birch panel there for now, to be picked up late next week when I gather all the supplies for the class. The last few days have involved a lot of exhibition related stuff, our committee for this railroad themed show working to get the schedule and rules in place. Last night Pat sent me the final design for the postcard, with all the necessary text placed over the artwork. I had envisioned white overprinting on the design, so chose a color scheme with broad areas of mostly bold deep colors. I had passed that suggestion on to Pat along with the original artwork, and she did an excellent job of finding a way to make everything fit. All the important information, not too crowded, and all easy to read. The BAC put the image out today in their weekly newsletter, the first announcement reminding people we will want participating artists, so I figure it's safe to post it here as well. It has been a week since I pulled the two proofs of my train image. The plan was to color it during the week, but the never ending snowstorm that is 2014 slowed down my progress. It's done now, so here's how it happened. I had printed the two copies last Saturday afternoon, finishing just in time to get to the latest opening at the Boatworks. The prints stayed home to dry, but at least I could show a photo of the black and white proof to interested persons in Belmar. Two days later I brought the practice (second) proof to the February critique, dry enough to transport but I wanted to give it another day or two before I started coloring. The next day was my long school day, leaving me no time for art. Then another big snowstorm, a statewide state of emergency that would keep me close to home for a few days, including an hour of shoveling wet heavy slush. At least I finally had time to start coloring the practice proof. I used my original photo of the scene as a starting point. I made the sky a deep ultramarine color (in line with most of the vintage posters I've seen) rather than the pale sky blue I had shot that day. And the brick platform in the foreground, that became a bold mix of some quinacridone colors. I did my best to match the colors from the photo for the train, though my version of the lower half severely simplified the mechanical components. In the end, I wasn't satisfied. That big hunk of New Gamboge (yellow-orange on the side of the locomotive, reflected late day sun probably) was accurate to the photo, but I didn't like having it dominate the middle of my image. And that brick color was too bold, out of balance with the value and intensity of building colors. Spent a day looking at it before I decided to make a few changes and start the second (good) proof. Began it last night and finished it today. Some colors were kept the same- the sky, roofs on the buildings, the naples yellow platform edge stripe, and the rails. The brick platform in now a lighter shade. 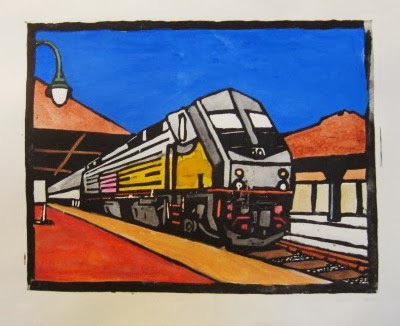 I replaced the pale black washes used all over the train with washes of pthalo blue (for light silver) and indigo (for dark grays), bringing in a little more color. Got rid of the big golden side of the locomotive, though there is still a hint of the NJ Transit colors, and a paler version of that warm yellow is used in the front windows. Also colored the far side platform that I hadn't bothered with in the practice proof. I don't know if this was the best solution, but it's definitely better than the first one, and if the goal is to get these postecards made and distributed soon, this is our best option. For the past few days, forecasts had told us the next batch of snow would arrive late this afternoon, around 5 or 6 pm. My plan was to get this finished by around 3:00, then run it over to Pat in Belmar so she could scan it and prepare it for the postcard. (crop, add text, etc) At 3 pm I was done, and I looked out the window to see a blizzard going on, either the third or fourth this week depending on how you count them. This one won't be too deep, but it was sticking quickly and very slippery. So I e-mailed Pat a photo so she could begin thinking about it, and I'll just have to hope for a dry day soon so I can put the art in her hands. Meanwhile, my part is done. About a week ago I mentioned taking a few minutes to reshoot jpegs of a couple of older works so that I could submit them to the big annual juried show in Belmar. At the time I said I'd wait until I learned if either was accepted before I wrote about them. Because of the large number of entries this show gets, traditionally the rule has been an artist may submit up to two works, but at most one will be accepted. I don't know if a conscious decision was made to change that, or if it's an effect of the work all being judged from online images, but this year about 20 artists had both entries chosen, including me. So tonight you get two stories for the price of one. 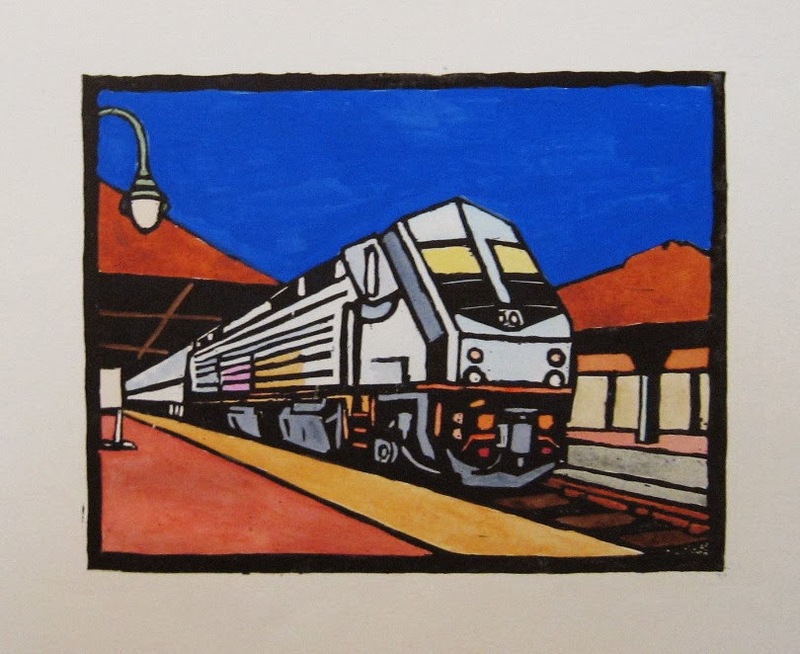 My first entry was a hand colored woodcut from about 10 years ago. In 2001 I had a small solo show at what was then called the Gallery of South Orange, which occupied a few rooms upstairs in a recreational building. It has since been renamed for Lennie Pierro, who co-founded the gallery, and I met at my opening, the last show he saw there as he died shortly after that. (also dying during the run of my South Orange show were a few thousand people in nearby New York City when the World Trade Center was destroyed two days after that opening) In 2004, to mark the 10th anniversary of the gallery, all the artists who ever had solo shows there were invited to produce a new work with a theme of "10" for inclusion in a special show. The association that made the most sense to me was the 10 pins in a game of bowling. To emphasize the pins in my composition, I decided to show a scene from the point of view of that end of the bowling alley. Modern alleys all have automatic pin setters and ball returns, which would make that view impossible, but a few generations back those tasks were handled by a person, who jumped down into the pit between balls. Throw in the fact that I had a photo of my grandfather's showing a bunch of bowlers in action from the pin point of view, and the idea was all set. Had to do a little research into what typical bowling alley pits looked like, but after that it came together quickly. 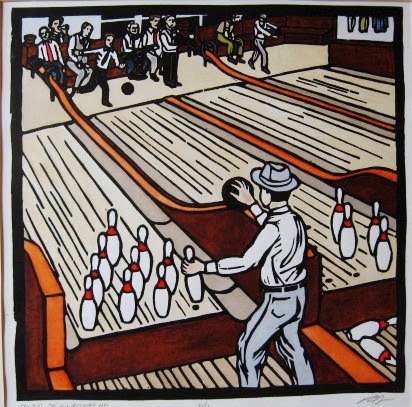 My biggest concern was that the show would have a lot of bowling themed artworks, but of the 80 pieces in the show, mine was the only one. The print has appeared in a few of my solo shows and been juried into a few group shows, but it's not one fo the 400 or so works I've shown in Belmar, so I made it one of my entries. The other piece goes back even further. In the late 1990's, my protege Tom Huck and I were both a few years out of grad school and looking for good opportunities to build our reputations in the print world. I don't remember whose idea it was to organize an exchange portfolio (we had both participated in them before), but he made the suggestion that the theme be William Blake. 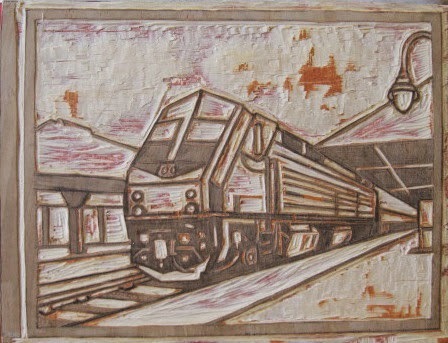 Blake is celebrated both as a writer and an artist (including printmaking), so both parts of his career could be referenced by pieces in the portfolio. Eventually I found one of his longer written pieces, The Marriage of Heaven and Hell, in which Blake writes about some of his unusual religious beliefs. He tells the story of an angel showing him both heaven and hell in an effort to convert him to more orthodox beliefs. The angel leads him down a passage deep into the earth of show him hell, and Blake sees tree roots and large white spiders overhead, and giant black spiders on the ground. When he askes the angel where hell is, he's told between the black and the white spiders. Another part of Blake's piece is called "The Proverbs of Hell", some of which would not be out of place next to proverbs from the Bible, and some that definitely would be. One that I thought had visual appeal was "drive your cart and your plow over the bones of the dead." I envisioned this as a man plowing up a cemetery, one in Blake's underground spider infested hell. The biblical verses on the tombstones all mention graveyards in some way. I don't know if the average art viewer would look at my piece and be aware of the Blake theme, but its another nice print that hadn't shown up in Belmar yet. Now it will. 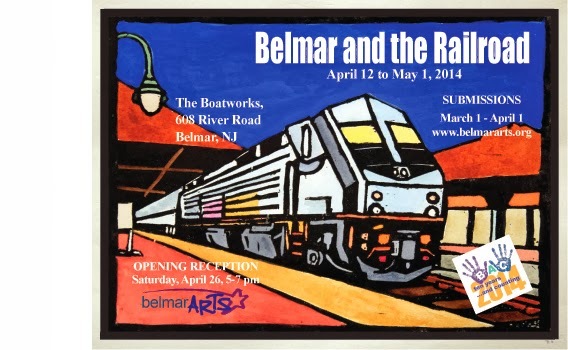 The 10th Annual Jersey Shore Juried Art Show opens March 8, 2014 at the Boatworks, with a reception from 5 to 7 pm. The show will remain on display during regular gallery hours through April 11, 2014. Today is Monday, and as has become a regular Monday activity, my first task of the morning was to clear snow from my car and shovel out my parking space. Last Monday's snow was a really big one, forcing us to postpone the scheduled critique to this week. Today's shoveling (snow from last night) was relatively light, and by the afternoon what had fallen in the streets had melted and dried in the sun, so our critique could happen. Tonight we were on location, meeting in the room used by scout troops at First United Methodist Church in Belmar. Why? I'll get to that in a little bit. We had 8 people come out on what must by the 50th consecutive bitter cold night, 6 of the people with art to show. Above is a drawing on linoleum from Molly, my proof of the train postcard, a paining from Sheilagh, and (on top of that electric outlet- click to enlarge) a ceramic head from Margery. 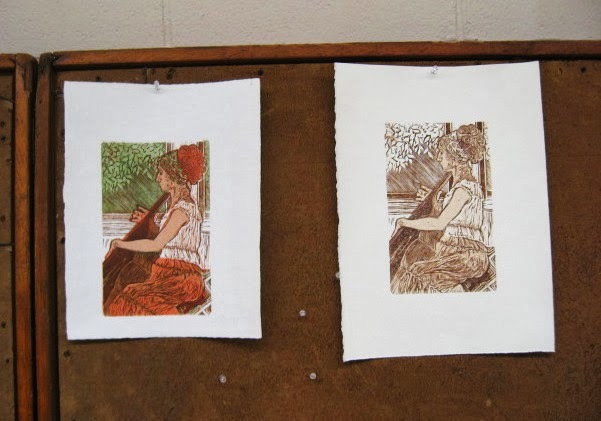 Mary brought two versions of her latest print (above), her intended contribution to her first group folio. We generally favored the four color version. 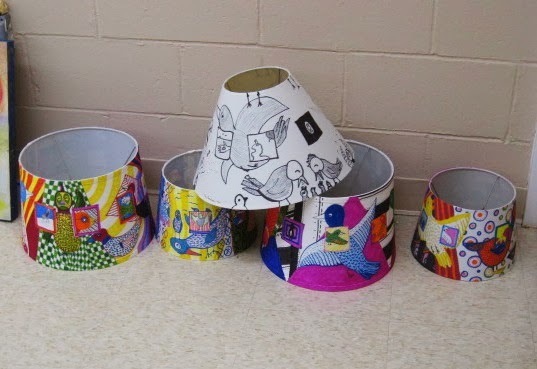 Below, Tim had a bunch of very colorful lampshades he recently created. So the reason we did this in Belmar was that Molly wanted to show her latest work, an entire altar created for the church. This is a continuation of her table project- much of this particular Belmar street was under water in the aftermath of Sandy, and an altar is essentially a table. For all those tables last year, she just made the tops and I built the structures. 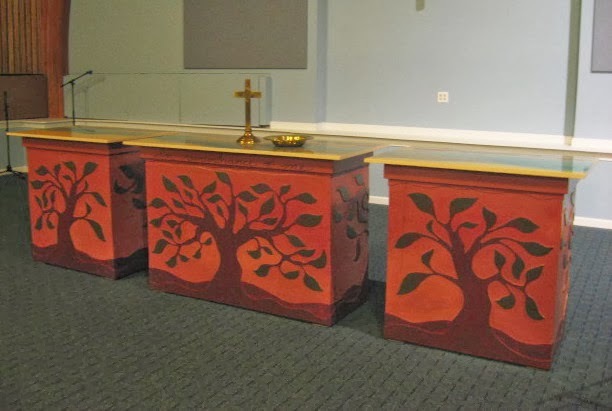 She did the tops of this three piece altar (the pieces were on display during the table reception back in November), but also facing panels for three sides of each structure. I was curious as to when and where she did these, as we emptied out our table shop months ago, and then we got the answer. She led us to an upstairs room where she is working on a similar piece for another church connected with this one. There was even a giant pile of sawdust from all her router work- no need to photograph that as there are plenty of photos full of sawdust if you go back through this blog. Had another busy week since the last update on this project. In 2014 that automatically includes at least one significant snow storm (this past Monday), and this time of year there is a lot of school stuff to deal with. 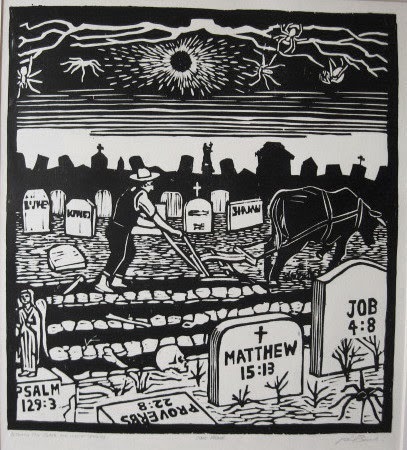 I've also been putting together a woodcut class to run in March at the Belmar Arts Council. The weather being what it is this year, I figured it would be safer to work on this from home. Gradually I cut the block, finishing it last night. Most of it went well, but the surface had some breakdowns, and unfortunately, these were in the areas with the most details. Still, I had gotten the block to the above state, just what I had envisioned a few weeks ago. Since I'm about a week behind my planned schedule for this project (having to devote several hours each week for the past month to shoveling snow will do that), I moved right on to pulling some proofs today. The first proof (above) was clean and good enough for the card artwork. I went ahead and tried a second one, and had another chunk of the surface break down. In a few days I'll use the second proof to test the color palette I have in mind. I'll apply what I learn from that to coloring the first proof. Assuming that turns out as expected, I'll turn that one over to the BAC to be converted to the digital file to be used on the postcard, poster, and whatever other promotion will be done. When the ink on the block is dry, I may recut the damaged areas- won't be exactly the same as the first proof, but it may salvage it for a second edition. I also used part of today for another BAC related thing- submitting this year's entry for their annual juried show. Don't have much recent stuff that I haven't shown at the Boatworks already, so I went back into the past. One of the pieces was created a decade ago, and the other goes back to the last century. This is the first general show there being done entirely by digital submission, so this morning I reshot the two pieces and I sent in the jpegs and online form in the afternoon. We'll be informed of the juror's decisions in about a week. If one of my pieces is chosen, I'll provide the story behind it. It's been a couple of weeks since my last post on the topic of this train show, so time for an update. Those two weeks were very busy. They include the first two weeks of the spring semester, so the first and second meetings of the semester for each class. In that time there were at least three snowstorms that I can recall, each of which required a bit of snow shoveling. There were also some doctor appointments, and two visits to the DMV to resolve an issue with my driver's license. Been trying to find an ideal time to run the next series of woodcut classes in Belmar, trying to accommodate the most potential students. 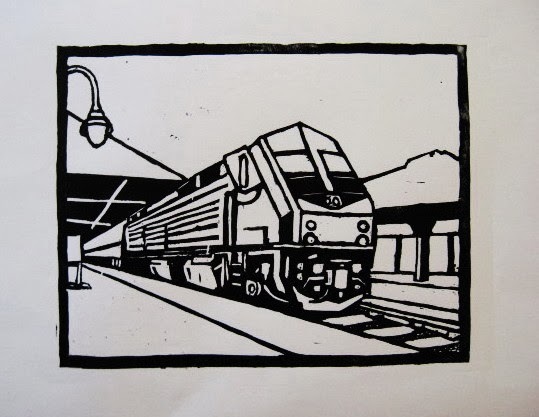 And yes, I've been working on things related to the train show, including my woodcut for the postcard. The previous rough sketch I had done was on a page in a sketchbook, which I had done in a portrait orientation. 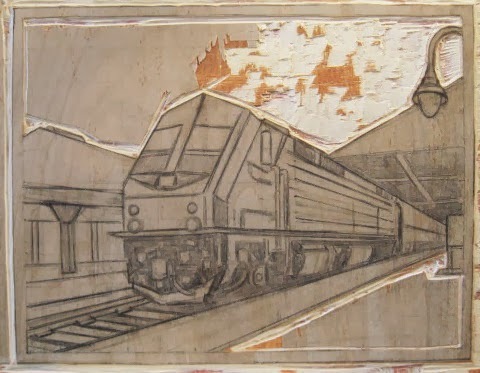 However, even though this train view wouldn't be quite horizontal as the one used in my mural proposal, I still felt this would work better as a horizontal image. Pat had sent me the proportions used by the postcard company, so a few weeks ago I was in the Studio long enough to prepare a woodblock. Much of that next week was busy with school and snow, but not a day passed when I didn't think about the image I wanted to make. Last week I began drawing. First I did a pencil sketch on paper of the scene as I expected it to look in the final print. It is relatively close to one of the photos I shot last summer, though I did adjust a few proportions and locations to better suit my composition. Once I felt that was ready, I put a grid over the top, which would aid me in transferring my train station scene to the block, which would involve both reducing size by about 25%, as well as doing a mirror reversal, showing the train going from right to left. Working at home around other tasks, I made adjustments and got it to a satisfactory state (above). My original goal was to have it printed and a color example to show the committee by today, but all that stuff mentioned above didn't let that happen. I was able to at least start the cutting, and so far this block is cutting nicely. Today we had a meeting in Belmar to discuss the progress on this show, this time bringing in our contact from the town historical society, which is going to be running a bunch of related programs of their own at the same time. There had been a bunch of e-mails back and forth over the past week, which had helped us settle a lot of details before this, but it was good to all be in one place, and we could discuss a lot of issues and concerns related to the historical part of the show. Our history guy seems very knowledgable about the subject, and has some experience organizing shows and talks, and he seems like he's going to have his part, which will include the seeking of railroad related artifacts, under control. The traditional art show stuff will fall our committee at the BAC. Although it wasn't needed for today, I did bring my in progress block to show people, as well as the train themed print above. It's from the late 90's, one of two dozen prints in my Birds and Seeds series, in which each image had a reference to a bird and a seed in some form. 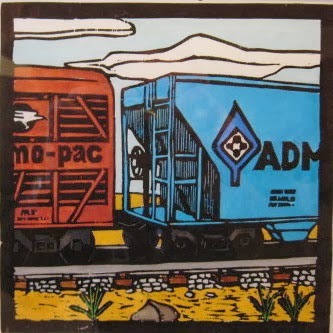 The series was originally inspired by my time living in the midwest, and long lines of ADM owned railcars passed through town almost daily. Most often it was tankers full of corn syrup, but I saw quite a few grain hoppers like the one shown above. I had to do a bit of research to find a rail car logo with a bird, eventually finding this Missouri-Pacific symbol. I don't remember seeing one there in Carbondale, but being only about a dozen miles from the state line, it's possible that some of their cars may have had occasion to pass through our town. I have this print already in a frame, and when this show was announced, I figured it would be the ideal piece to submit. 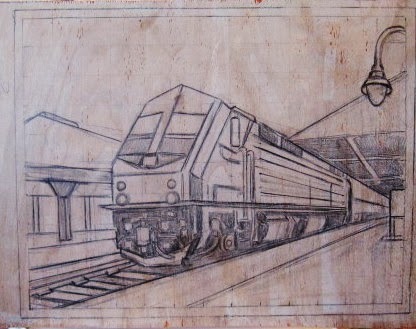 I brought it with me to the meeting to demonstrate how my block drawing of the train would translate into a colored woodcut. 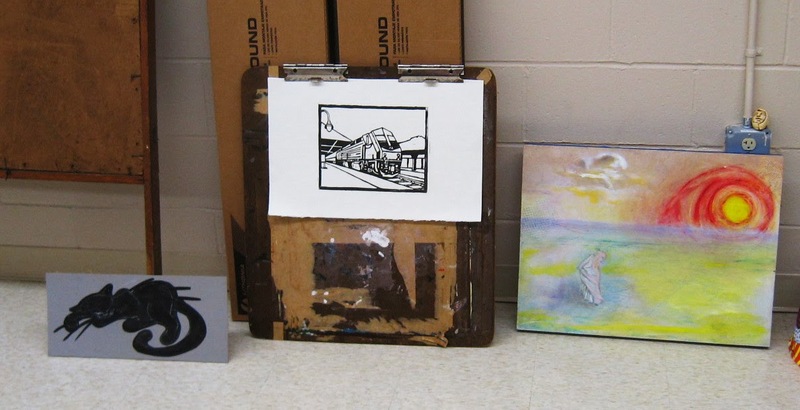 Everyone liked both my finished print and my block drawing, and they are excited to see the finished piece. I expect to have that done within a week.